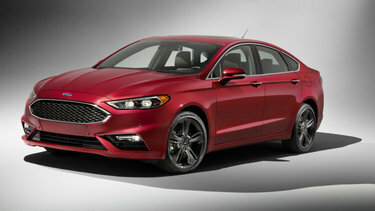 Ford Motor Company has released a big announcement for the 2017 Ford Fusion – a new performance-oriented model, the Fusion V6 Sport. According to Motor Authority, the V6 Sport will consist of a 2.7-liter twin-turbocharged V-6 with 325 horsepower and 380 pound-feet of torque. It will also offer a 6-speed, paddle-shifted automatic transmission and all-wheel drive. The best part is that this model will come with a drive modes selector with at least seven modes. The dial located in the center console will allow drivers to select the mode and change systems such as suspension, throttle, steering and transmission. The modes to keep an eye out for are; the Engine mode, which improves throttle response, the Handling mode, which stiffens the suspension by adjustable dampers, and the Transmission mode, which hold the gears for a longer amount in time, which improves responsiveness. So the big question is when we can find the 2017 Ford Fusion for sale in Renton, WA. The answer is that they will most likely be making their way into show rooms around early fall. What we do know for sure, that Ford was willing to share, is that the starting price will be $34,350.